Do firms in happier places invest more? Economists—and other social scientists—are now using a burgeoning body of research based on surveys of reported well-being or, more colloquially put, happiness. They are studying areas as diverse as the effects of income, inflation, unemployment, exercising, smoking, and marital status on well-being. They are also exploring the effects of well-being on individuals’ attitudes about and investments in the future. The results are not surprising: smoking, inflation, and unemployment (particularly the latter) are bad for well-being; while income, exercise, and marriage are, on average, good for well-being. Individuals with higher levels of well-being on average have better future outcomes in the health, labor market, and social arenas. The latter is due to innate optimism and intrinsic motivation on the one hand, and the capacity of individuals with higher levels of well-being to make choices about what kind of lives they want to lead on the other. In short, numerous studies show that higher levels of well-being are associated with all sorts of positive outcomes. It is important to note that the use of these metrics requires methodological precision. Scholars do not ask respondents if particular things make them happy or unhappy. Instead, they use large-scale surveys with the well-being question of interest up front in the survey. They control for all sorts of socio-demographic traits (such as income, gender, age, education, and employment status) and assess how well-being levels vary with the variable of interest, holding all other things equal. Does happiness play a role in corporate economic behavior? We recently explored whether well-being is relevant to our understanding of firm behavior and found, rather remarkably, that it is. The traditional thinking in finance and economics is that economic actors are rational and maximize their self-interest by decisions that are not influenced by nonmonetary factors. However, substantial evidence shows that sentiment, mood, and subjective well-being indeed influence economic behavior. In our paper, we explored whether the subjective well-being of company decision-makers influenced firm behavior, specifically investment policies. We addressed our question by asking whether firms located in places with higher levels of happiness invest more. Our measure of happiness was average reported life satisfaction at the metropolitan statistical area (MSA) level. 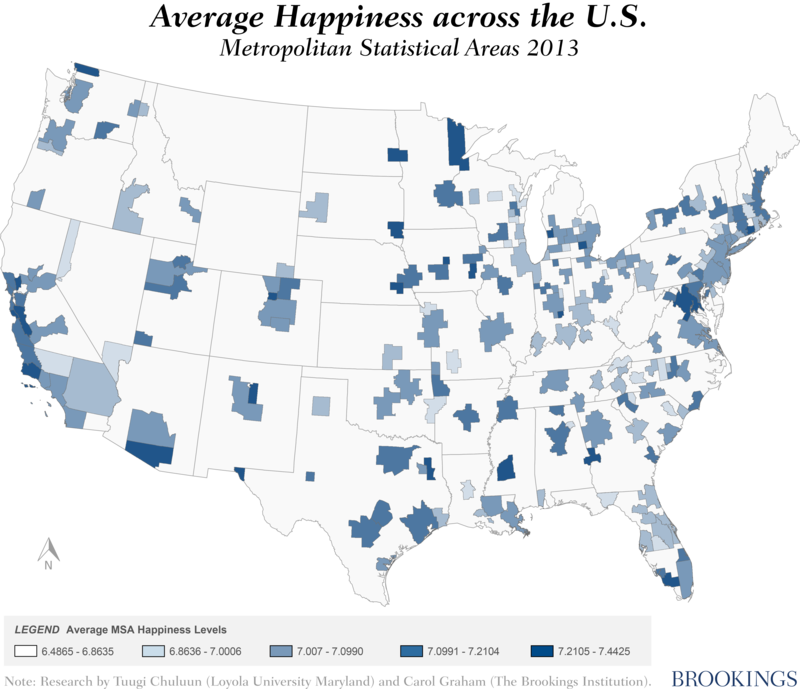 The distribution of average happiness levels across U.S. MSAs in 2013 is graphically depicted below, showing that local happiness varies across the country. The figure above illustrates the average happiness of 207 Metropolitan Statistical Areas that are included in our sample for 2013. Happiness is measured by the best possible life question from the Gallup-Healthways poll, which asks respondents to compare their life to the best possible life on a scale of 0-10 with 0 corresponding to the worst possible and 10 to the best possible life in terms of how the local residents view their well-being. The map contains gray areas because some rural areas do not belong to any MSA and happiness data is also not collected from some MSAs. We also looked at the distribution of happiness within MSAs; in other words, in addition to average levels, does inequality in happiness levels across local populations matter? We used detailed data on reported well-being from the Gallup-Healthways poll, which interviews approximately one thousand respondents across the United States each day; local income, wage, and employment data from the Bureau of Economic Analysis and the Census Bureau; and accounting data on publicly traded firms from Compustat. Can well-being influence business decisions? We find a clear association between firm investment behavior, especially investment in research and development (R&D), and average happiness levels. Controlling for all sorts of possible intervening factors, such as local population growth, firm size, and the like, we found that firms located in areas with higher levels of average happiness had higher levels of investment. The distribution of happiness also mattered—firms in places with greater gaps in the distribution of well-being were less likely to invest. In other words, the association between local happiness and the investment levels of local firms was stronger in places where the residents were more uniformly happy instead of places with significant unhappy cohorts. R&D investments are often directed toward the development of a new product or a technology and thus are more prone to subjective decisions and projections about future outcomes than are standard capital investments. Therefore, the stronger association with reported well-being makes sense. Our results were also stronger for younger firms. The decision-making process at younger firms may be less codified and more subject to the effects of happiness and sentiment. As noted above, the well-being literature suggests that not only do things like better health and jobs make people happier, but that happier people are also more likely to be healthy and to make investments in the labor market and in their own futures. We see that it extends to corporate decision-making. We cannot make claims about causality given the cross-sectional nature of our data. And, of course, there are factors that we cannot observe that may attract both happier people and more innovative investment activity; there is much about well-being that is unobservable yet linked to better outcomes at both the individual and community levels. While we cannot fully resolve these questions, it is our hope that by showing that firms (and particular kinds of firms) located in happier places are more likely to invest, our findings pique some interest in the extent to which well-being and its distribution can inform and influence business decisions.